i sometimes find myself working on a project where the views require more than a single iScroll. When that happens i always need a method of keeping track of them and destroying them properly as I switch between my views. What I describe here is a simple way to accomplish this. Next you’ll always need a way to know when the user is interacting with an iScroll so for that purpose I created a boolean variable for my controller to check whenever needed. // is the iscroll scrolling? With that done I then need a function that will create my iScroll objects and push them into the _iScroll array. * Creates any number of iscrolls. As you can see within init_iScroll() I feed the CSS ID of the element whose contents must be scrolled to the function. 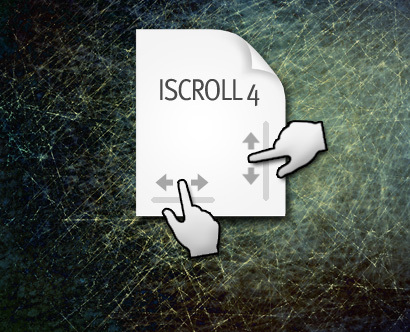 The new iScroll is created and a reference is added to the _iScroll array. Next I configure the scrollstart and scrollend events. Looking at these you can see that when they fire they change the value of the _isScrolling flag. The result is that my application knows when scrolling happens and thus can differentiate between a swipe intended to scroll an iScroll “pane” or a touchend event meant for some other UI element. I of course need to create a getter function to expose _isScrolling to other parts of my app. * Destroys all iscrolls contained within the _iScroll array;. And with that you have everything you could want to manage any situation; a method of keeping track of iScoll objects, creating them, destroying all of them or just destroying specific iScrolls. Below is the complete set of code. * Destroys specific iScrolls based on the ID of the wrapping element. I hope you find this useful, happy surfing…..